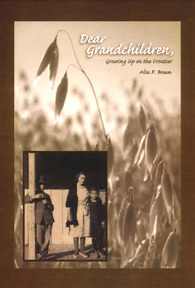 Alta Frances (Brown) Brean recounts her life as a child among the Brown and Collier families on the frontier in the early 1900s. With vividness and unusual clarity, she brings her readers back to a much simpler time nearly a century ago: a time when children drove horse-drawn wagons to school; a time when families lived in tents or in "Homestead houses." From the Indian Territory that would become the state of Oklahoma, to the newly admitted states of New Mexico and Arizona, Alta's family pursued their dream of living in a land "where a man could raise cattle and make a good living without the hard work associated with farming." But they discovered that ranching wasn't so easy either. From snap dragons in spring to sad irons in winter, this is the true account--told in rich detail--of farm life in Oklahoma and pioneer life out West in the early Twentieth Century. Copyright © 2002-2009 Alta Omnimedia. All Rights Reserved.